Welcome to Reyland's of Seavington, TEL - 01460 929121. This Nissan Juke NISMO is in excellent condition, the best example we have ever seen and is ready to drive away today. 17th JANUARY 2020 MOT + FULL DORCHESTER NISSAN SERVICE HISTORY + 12 MONTHS AA BREAKDOWN COVER + 3 MONTHS NATIONWIDE MECHANICAL BREAKDOWN WARRANTY+ EXPERIAN HPI CHECKED + FULLY DETAILED INSIDE AND OUT. ***SERVICE HISTORY*** 1st @ 3,610 Dorchester Nissan, 2nd @ 6,878 miles Dorchester Nissan, 3rd @ 8,536 miles Dorchester Nissan, 4th @ 16,431 miles Dorchester Nissan, 5th @ 21,455 miles Dorchester Nissan. Reyland's are pleased to offer you this stunning Nissan Juke NISMO finished in Pearl White, this car really stands out from the rest being a Pearl White NISMO extremely high specification, including LED day running Lights, alloy wheels, heated seats, Alcantara "NISMO" embroided seats, Reverse Camera, rear spoiler, tinted windows, "red" electric folding mirrors, SAT NAV, radio/cd with aux, keyless entry, auto lights, auto wipers, hands free telephony, cruise control, 3x3 rear belts/ISOFIX, electric windows, air conditioning, Sport/Eco/Normal driving modes with 6 speed manual gearbox. 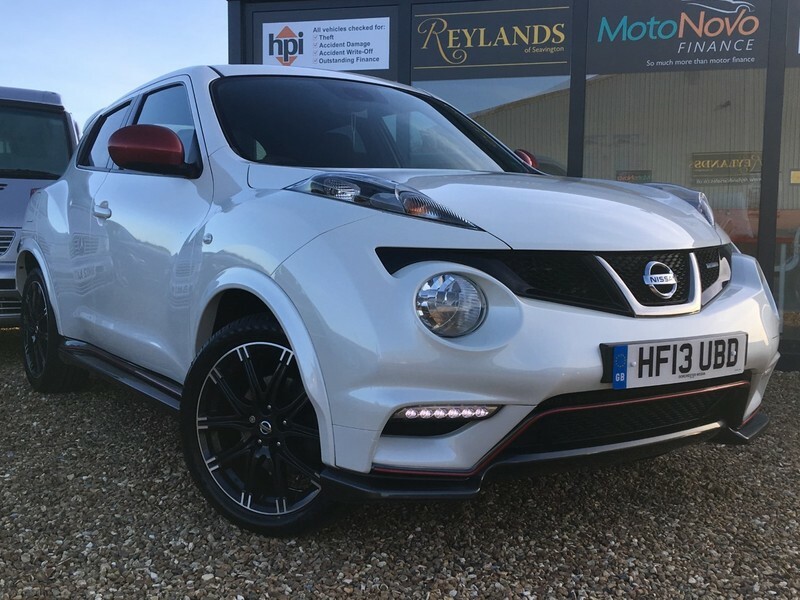 Reyland's recommend early viewing on this car to avoid disappointment as this is a super example of a NISMO JUKE with such low mileage supported with FULL DORCHESTER NISSAN SERVICE HISTORY and present to excellent condition, and is READY TO DRIVE AWAY TODAY. Please visit reylandcarsales.co.uk.